Puss In Boots. Golan-Globus Productions 1988. Welcome to Yesterday’s Movies’ Holiday Gift Guide for Adults Who Always Get The Wrong Thing. There are less than ten shopping days to disappoint a young person close to you this Christmas, and if you’re looking for a movie that’s sure to get a reaction, you could do worse (better?) than the 1988 Puss In Boots. I have never heard of this film before I found it, but if your kid was expecting Ant0nio Banderas’s feisty CG kitty in some kind of adventure involving Humpty Dumpty before Puss ever met Shrek (I haven’t seen it… yet), this is guaranteed to cause some sort of emotional setback. 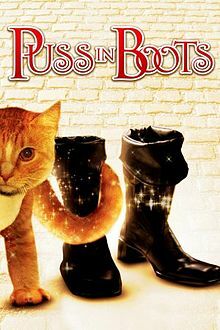 This movie features Christopher Walken as the voice of the cat in Live Action musical telling of the original Puss in Boots story. There’s potential there, but also so much room to fall short. A miller dies, leaving little but the cat to his third son. The cat, not content with the insults his new master bestows upon him, turns into Christopher Walken and tells him “give me some boots and you’ll never want for wealth.” Receiving his boots, the Walken Cat begins currying favor with the king on behalf of “the Marquis of Carabas”, and soon the miller’s son is invited to the court. Puss bluffs his master even further into favor, and soon the princess (who is acknowledged to act far too common for her station) falls in love with this “marquis”. But some idle boasts from servants aren’t quite enough to convince the king to allow them to marry, and Walken in Boots has a few more tricks up his sleeve. I’m not quite sure how I feel about the title Puss not being a puss for most of the movie. On the one hand, it smooths over why nobody at court was shocked at a walking, talking cat. On the other, this is a story with an ogre who can turn into any animal he likes, so magic is nothing to question. Puss being a shape changer does allow for one scene where he eavesdrops on the king and queen by turning back into a cat and letting himself be held. Besides, 80s puppet technology would have been much worse. As for the quality of the film, it’s no The Princess Bride-level production, but I see a decent amount of money on the screen. The effects had a lot of room to be better, but not many are needed. Most of the time that Puss’s changes from cat to human are done with simple cuts, that is good enough, and better than the hard cutting used to show the transition. At least the Ogre gets fades when he changes shape. The writing is the weakest link of the film. Admittedly, by the time Puss’s master meets the king, the movie has shaken off most of its awkwardness, but that raises it from awful to bland. The music as well is fairly unremarkable. One thing I did appreciate about the writing is that at least it’s paced well after Puss gets his boots. This is a story that can be told in ten minutes but is padded to an hour and a half very comfortably with just some music and a short, not-terrible stop to develop a love interest. Gift this movie: If your favorite youngster to disappoint likes cats and is easily disturbed by Christopher Walken telling a young man he’s going to watch him as he sleeps, as he’s been watching him his whole life. Don’t gift this movie: if the only thing the kid didn’t like about the Shrek franchise is the lack of easily singable songs. I never saw this one. I never even heard of it. I may rent it. I like Walken enough to want to see it.